Getting overseas was a long, frustrating, and arduous process for all correspondents, male or female. The bureaucratic obstacles alone would prove daunting to many. First, the War Department had to agree to the assignment, do security clearance, and provide accreditation documentation. Then the Department of Immigration and Naturalization (INS) took over. The INS issued passports and immunization certificates. Unfortunately for female correspondents like Chapelle, the INS was headed by Mrs. Shipley, a formidable personage with a deeply held belief that women should not be exposed to the dangers of a war zone. She did what she could to keep women at home. If women journalists could get past Mrs. Shipley, they found themselves face to face with myriad government restrictions. Reporters were then assigned the rank of captain to ensure their protection if they were captured, and attached to a unit. The Supreme Headquarters Allied Expeditionary Forces (SHAEF) opened and closed battle zones to reporters at will, depending on their sense of the danger. And individual generals had their own rules about women war reporters assigned under their command. Finally, they needed to secure passage overseas. Reporters were not always high on the priority list, and women reporters even less so. For the women reporters who did make it to a war zone, they were contained with the Women’s Army Corps (WACs) or Army nurses, away from the battlefront. The government cited safety concerns or logistical reasons such as lack of women’s latrines. The women reporters’ stories were inevitably informed by the physical fact of their separation from the front lines. 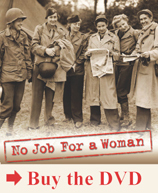 They wrote about the day-to-day lives of the soldiers, nurses, field-hospitals, the WACs. In professional terms this would mean these women would never have a front page story, nor would they garner the promotions, prestige and awards that the telling of such stories would attract.